Bradley Manning: "Everything is Going to Be OK"
Bradley Manning, moments after being sentenced to 35 years in prison, turned to his attorney David Coombs and told him, "It's okay ... I'm okay, everything is going to be okay." Coombs said it was the first time a client had cheered him up after a verdict. As the verdict was read, Coombs' wife wept while Manning's aunt and cousin showed no visible emotion. The courtroom erupted with chants of "Bradley, we are with you" and "We will keep fighting for you." As Manning exited the courtroom, the last voice he heard was Medea Benjamin shouting: "We love you." Cornell West commented after the proceedings that "Bradley felt the love and it was beautiful that he received such wonderful support." West went on to say, "It is a sad day in America when the revealer of war crimes goes to prison while the war criminals remain free. Democracy needs an informed public, and without people like Manning and Edward Snowden we can't make informed decisions on who should represent us. We need to know what our government is doing in our name." Chris Hedges told RSN, "Even the use of the Espionage Act in this case was an utter perversion of the intent of the statute. Whistleblowers are not committing espionage." Hedges went on to say, "We are witnessing the collapse of the media's ability to cover the national security state. The government leaks secrets all the time. When I was at The New York Times, I published top secret information. Nothing Manning leaked was top secret. This prosecution will have a chilling effect on the media's ability to perform its role in our democracy." "Since 9/11 we have witnessed an explosion in the national security apparatus. We are at a defining moment. How do we want to live as a country? What freedoms are we willing to give up? "The charges against Manning are unprecedented for providing information to journalists. It is a watershed moment for freedom the press. We need whistleblowers like Bradley Manning with the courage to speak up and not remain silent. Manning provided us with information that he believed would spark reform and would spark debate on the wars our country is engaged in. "The time to end Brad's suffering is now. The time for President Obama to pardon Bradley Manning is now. 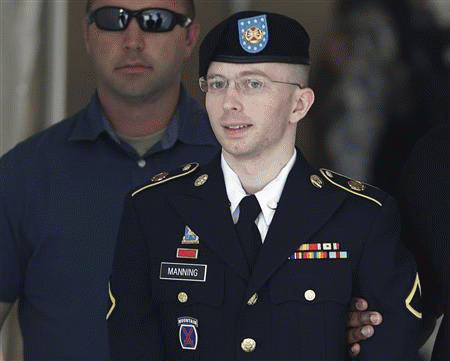 I will file papers next week asking for President Obama to pardon Bradley Manning. "Part of that request will be a plea from Bradley Manning, which began: 'When I chose to disclose classified information, I did so out of a love for my country and a sense of duty to others.' He closed by saying, 'If you deny my request for a pardon, I will serve my time knowing that sometimes you have to pay a heavy price to live in a free society. I will gladly pay that price if it means we could have a country is truly conceived in liberty, and dedicated to the proposition that all men and women are created equal.'" Manning quoted Howard Zinn in the statement: "There is not a flag large enough to cover the sins of killing innocent people." Coombs said Manning will first be up for parole in 7 years. All sentences over 30 years in the military are subject to parole in 10 years and Manning has already served three years. *Scott Galindez was formerly the co-founder of Truthout, and is now the Political Director of Reader Supported News. anonymously sourced from either the web or a forwarded email. Most Massive Natural Disaster in US History-- and you don't know what caused it.